It seems impossible now, but there was once a time when there was no myspace, when if you heard about a band you were interested in you had to go and actually buy their music to find out. And if they didn’t have anything out, you had to go to see them live to discover what the fuss was about. 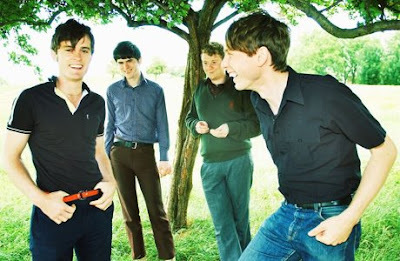 Even more incredibly, this was the situation in the summer of 2003, when I started reading some exciting blurbs about this new band from Glasgow called Franz Ferdinand (along with that picture up top). They had just signed a record deal with Domino and hadn’t released anything yet. So when they announced their first proper London headline show - A Night of Music and Dancing with Franz Ferdinand - at the Africa Centre in Covent Garden, I was there for sure. When me and my friend got there at about half 8, there was no-one in the venue. It was the right night, just that folks hadn’t got round to turning up yet. We supped South African beer and watched bemused as support act Simon Bookish threw some crazy shapes along to his laptop. Then a smattering of excitement across the crowd when four dapper chaps took to the stage in front of a projected black and white film. The music had many familiar touchstones - Talking Heads, The Fall, other new wave stuff, but was spun in a fresh and urgent new way. The set was short but thrilling and I knew I’d be hearing more from them soon. And no doubt seeing them in much bigger venues. Sure enough, the first single Darts of Pleasure was released that autumn and I snapped it up quickly. It was as good as I recalled from the gig. The following January Domino released Take Me Out, with I bought along with thousands of others following a good few months of hype. It was a huge hit, and deservedly so. Though Franz have been consistently good since, they’ve never really topped these first two singles, which have surely become an aspirational template for thousands of skinny boys with guitars ever since. The next time I saw Alex Kapranos and co, it was at Brixton Academy, part of a triumphant sell-out national tour. Though I’ve consistently enjoyed their music, nothing has ever topped the excitement of five years ago. As you’ve probably read, the new album’s been put back till next year, but they’re still tearing up small venues across the country on their current tour. Check out some photos from the Macbeth show in London a couple of weeks back. Here’s hoping the third album’s worth the wait. feels like yesterday. actually can you remember there were a couple of gigs that night that we kind of had a choice between? - the other one was Magnet. but you knew FF was the one to go for! this is a bit like ‘i love the noughties’…or This is Your Life! I guess that’s the plan, Dan. It does seem like yesterday in a way. I can remember more about that gig than many more years ago. And whatever happened to Magnet, eh?